Scalextric have recently brought out a My First Scalextric set as a great way to introduce younger children from 3 years to rally car racing and as a starter set of the collection. The box is well packed and perfect for storing the kit in after play. Simple instructions are provided with the addition how to change the braids and how to correctly look after and maintain the cars. Adult supervision is required for the set up. The nine piece track is easy to assemble by clicking together and runs off mains power so no need to worry about batteries running out! Parent win. The plug needs to be easily accessible as the cord does not have too long a length. The track itself sits in a figure of eight set up or it can be made up in an oval shape for smaller children. I like the fact that because of the magnatraction technology the cars stay well on the track rather than flying off every two minutes. My son loves the bold primary colours and the fact that the game encourages him to control the speed and use his fine motor skills. 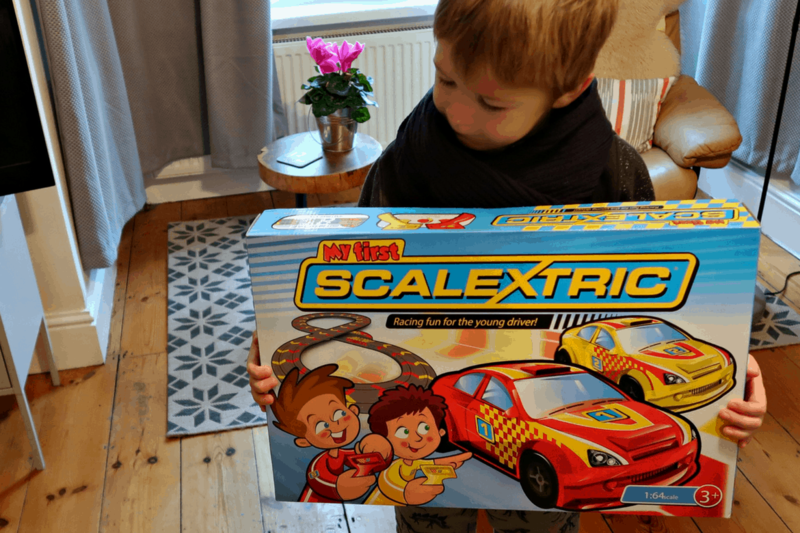 My First Scalextric has controllers that allow you to turn down the speed of the controllers for smaller children that are developing their hand eye coordination and dexterity. The continuing use of red & yellow throughout the set – cars, controllers and chevrons round the track makes it easy to recognise which side of the track each car goes, and which controller to use. I was worried at six that it would be a bit babyish for my son but he spent hours playing with it. Any toy which gets him off his tablet and engaging with humans is a win for me. Another bonus point is that My First Scalextric is fully compatible with the Micro Scalextric range of sets and cars so you can extend the track making the possibilities endless and it a lasting, value for money purchase. Note: We were sent a product for free in return for our honest review. This looks like great fun, I imagine my 9 year old twins would love showing their 4 year old sister how to build this!